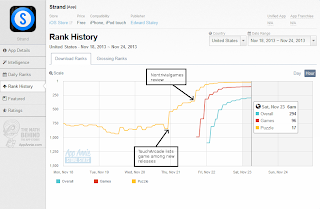 Of course I'm joking :-) This humble blog had no effect on the chart position; but TouchArcade probably had, unless something else happened at the same time. 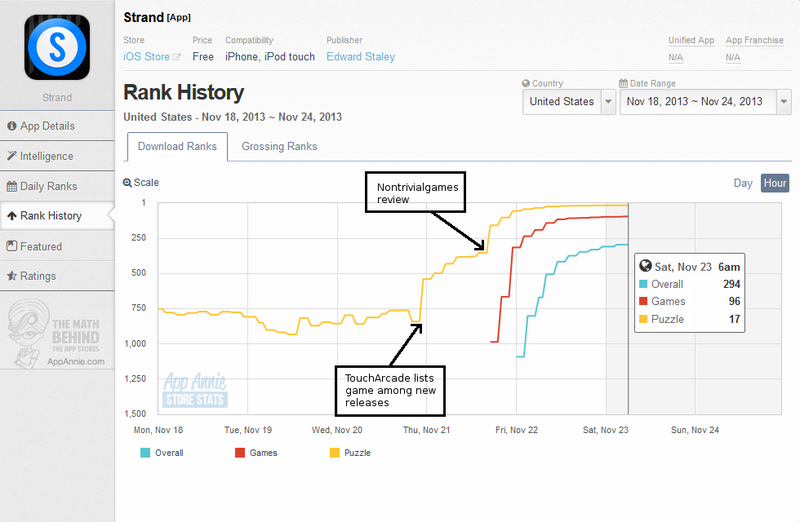 Strand had been sailing below position #750 in the Games/Puzzle chart, then it jumped to the top 20 in a couple of days. This was well deserved since it is a very good game, as I said in my review. It's good to see that a small indie game can still reach the top positions of the charts, however the other side of the medal is that despite being a good game, it was below #750 beforehand. This seems to prove that discoverability is poor on the App Store, and it's difficult to be noticed without coverage from major news sites.